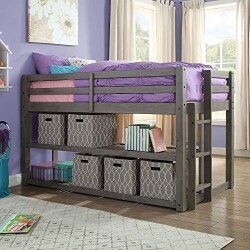 The Better Homes and Gardens Twin Loft Storage Bed will make bedtime a fun time! The lofted twin-size bed creates an open lower area that is ideal for many uses. Large shelves provide plenty of great storage and display space for books, toys and accessories. With multiple finish options to choose from, this is a bed that will complement your child’s room dcor. The bed complies with ASTM safety standards to provide the highest level of safety for your child. Sturdy side guard rails will keep your little one secure and sound while they sleep and dream.